The room filled at Aubrey Park Hotel for meeting powered by both the old and the new members. Leading the charge with the main speakers were Judy Mallinson and Karen Willis, both on their 9th speeches – just one away from Competent Communicator level. Judy won Best Speaker with Why I Drugged My Son, persuading listeners to recognise the reality of Attention Deficit and Hyperactivity Disorder. Karen’s All Work and No Play was a persuasive talk on making life’s work a joy, and how she and a little ducky mascot had achieved just that. Richard Beagle, already a Competent Communicator, delivered his 17th project, which was to appear as a “guest” on a televised talk show. He had artfully commandeered some lounge chairs for the set and answered questions on his favourite subject – Toastmasters – put to him by a very convincing interviewer Corinne Frydman. The audience was left wondering if there were new careers in the offing for them both. New members also showed their developing confidence with Atakan Akkaya mastering timing of all the events of the night on his second time in the role – it’s not an easy job – and Matthew Tang showing excellent observational skills as Grammarian. The level of evaluations at this meeting drew particular praise. Seasoned evaluators Anthony Brennan and Colin Donald, and JJ Lynch who is a confident speaker new to Toastmasters, all gave fulsome recognition for the speakers’ achievements and then recommendations for future speeches not just for the night’s line up but ideas that everyone there would want to take on board. Anthony was declared best evaluator. The other section of the night was the always popular and entertaining Table Topics (impromptu speaking). Tom Goodfellow shaped the questions around his love of music. This wasn’t too surprising because at another meeting he was put on the spot with a difficult question and responded with a rib-crackingly funny round of air guitar. JJ Lynch took the prize for his impromptu response, as always with the ease of someone who had been rehearsing all day. 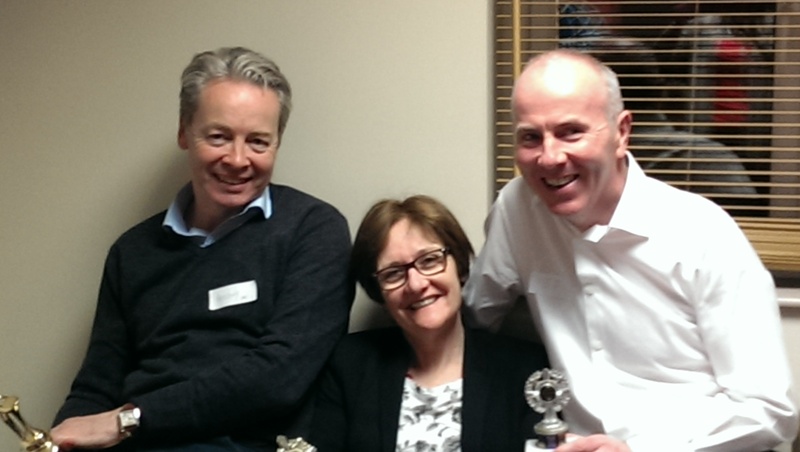 From left, Anthony Brennan (Best Evaluator), Judy Mallinson (Best Speaker) and JJ Lynch (Best Table Topics speaker).